I associate cinnamon buns with my childhood. The way they smelled every time I walked into the kitchen! And I went there quite often, thanks to my fantastic gran, Zenta, who always wanted to spoil me (everyone needs a grandmother like that!). We had a ritual – milkshake and a pastry, and when I couldn’t decided which to take, I would choose either a shortbread cookie with nuts or a cinnamon bun. But nothing beats the smell of baking cinnamon buns at home. 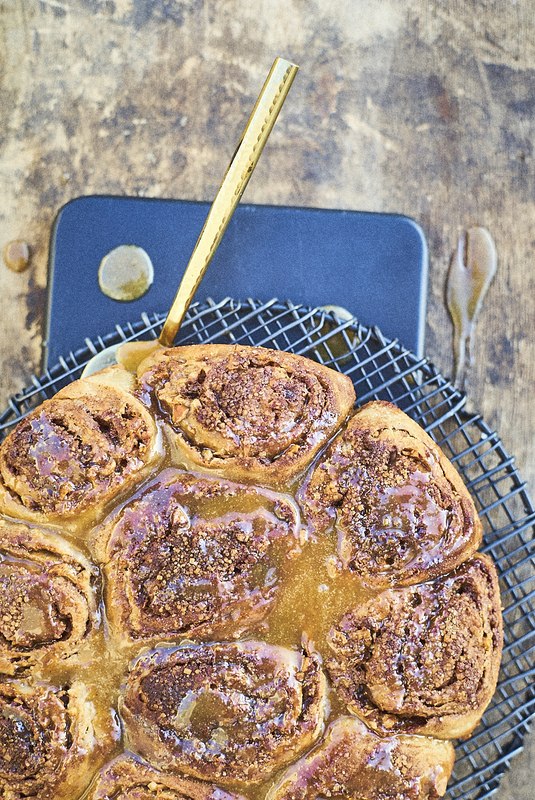 They already begin to smell good when the dough is rising – so good that you could eat the raw dough with cinnamon. But, you have to wait, bake, and then fall on them. Just out of the oven, they taste fantastic! Prepare the dough. Place the farina in a bowl, pour over the boiling water, and add 30 ml oil. Stir so there are no lumps and let sit for 10 minutes. If the mixture is still really hot, let it cool a bit more. In another bowl mix yeast with lukewarm water so that it melts completely. In a large bowl, place the flour (500 g), cinnamon, salt, sugar on one side, the farina puree on the other, and the yeast on the other (the one where there is no salt). Add water, egg and mix with your hands for about 5 minutes or with a mixer to 3 minutes until the dough starts to be elastic. Add 60 ml of oil and continue kneading for 5 more minutes with hands and 4 minutes with mixer so that the dough no longer sticks to your hands. If you think the dough is too sticky add some flour until it is not. But remember, it should not be dry. Better more sticky than dry. Place the dough in a clean bowl, cover with cling film and let rise until doubled in bulk. Combine the sugar, tonka and cinnamon for the filling. Line a 25 cm cake pan with parchment paper (only bottom) and grease sides with some butter. Sprinkle flour on your work surface and roll out a 35 x 35 cm large square. Spread butter over the surface, pour over whipping cream, sprinkle most of the cinnamon mixture and almond flour, and roll shut. But into 10 pieces and place on the pan. Sprinkle the remaining cinnamon mixture on the buns, cover all the buns loosely with cling film, and let rise until doubled in bulk. Heat the over to 200°. Place the buns on the lowest rack and bake for about 30 minutes. Then raise the temperature to 210°, place the buns in the centre of the oven or one above, and bake for another 5-7 minutes. Remove from the oven and let it cool for 15 minutes. Pour over caramel and serve.